The Prankster watches as Arion attempts to take control of Superman. Hearing the rumbles, Jimmy and Lois head outside to investigate. Superman, meanwhile, uses his training with the Martian Manhunter in order to avoid Arion's spell, ultimately defeating it with his own willpower. "Squad K" attacks Superman from out of nowhere mercilessly, engaging "Mind Control Alpha" protocol, attacking Superman with varying annoyances to slow him down. Two of the children from New Genesis (seen last issue) remain, watching in amusement. Arion is attacked by Squad K when they see him at the antagonist. Arion, deciding that Superman is too strong to be taken mentally, speeds away. Lois and Jimmy explore Squad K. Superman, realizing that he's losing Arion, shrugs off the Squad K attack and pursues, having almost lost Arion. As he does, he's hit by a giant pie from Prankster. He wipes away the lead-lined pie to reveal the Justice League with members of the Justice Society, prepared to take him down. Green Lantern tries to calm Superman, and Superman screams at him that he's fine. Arion flees, and the New God children follow him. Superman, not able to find Arion, goes to confront Squad K. They shake hands, and realize that Squad K is just a failsafe, parting amicably. Superman uses a robot head found by Hourman in the pie truck to track down and incarcerate Prankster, then he hovers above the city, speaking to Arion, telling him that he'll track him down. Story - 3: This isn't a badly written story. It's actually got a good bit of heart to it, and that part of the story is enjoyable. What keeps it average and stops it from being rated higher is the simple fact that it doesn't cover much new territory, heart or not, and it suffers from a diversionary subplot that isn't particularly interesting, along with a series of plot failures/holes that pull you out of the story. I expected a bash-it-out with Arion, and I'm pleasantly surprised that that was avoided, but it also raises the ongoing issue that this Arion story, which isn't particularly overwhelmingly interesting, continues and does not resolve. The Camelot vision was incredible, but honestly, as I've said before, the dilemma of Superman being forced into a position where he'd decide to stop being Superman or cede control of himself is neither plausible nor sympathetic. It's been dragging on for too long, and it's not extraordinarily compelling. Beyond that, every time the story begins to wind itself up, it's distracted by the kids, Squad K, etcetera. 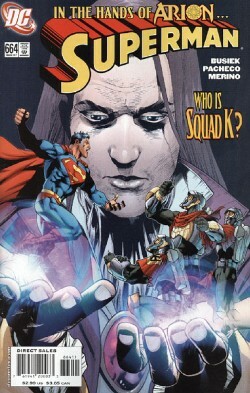 Squad K is an interesting concept, but it shows a bit of a contempt and misunderstanding for the way that Superman has, at least for the last twenty years, handled this dilemma. It shows Batman wheedling away the time trying to figure out how to take Superman down, because the kryptonite ring was taken from him by another Superman in Infinite Crisis. But what this story fails to acknowledge is the fact that Superman GAVE Batman that ring, acknowledges the fact that he must be stopped if he's taken over, and actively helps Batman find ways to do that. So the petulant flash to thinking of Batman, particularly given his understanding conversation with Squad K, contradicts itself. Superman has a backup plan, and that's Batman. So he should be sympathetic to Batman, and annoyed with Squad K, when the story portrays the reverse. Particularly given that Batman didn't stop him from catching Arion, and Squad K did without even confirming he was being controlled. Or, plot hole, with any real way of knowing he was being controlled at all. It was like an instant arrival, and sat odd with me. Beyond that, however, their attack was rather rudimentary given the fact that it's common knowledge that Supes is weak to K in this universe, and Loeb just launched a metric buttload of K to Earth. There's also Superman's snippy reaction to the Justice Leage/Society, which is quite out of character. He screams at them, so loudly that he knocks them aside in mid-air, and then gets all goth and emo with Green Lantern. Green Lantern: "Sorry, Superman. But you understand, we couldn't take that chance." Supes: "NO. No, you never CAN, can you?" I feel like adding, "Geeze, dad, you never let me do ANYTHING!" Just an odd scene. And also repeating a dilemma (a reluctant group trying to stop Superman, done just a few pages back), which is bad for plot, for a plug/guest starring appearance with the JLA. Unnecessary, and trying too hard. The same criticism of having no way to know that Superman was controlled applies. Beyond that, there's also an action break, whereby Arion decides he can't control Superman because he's too strong because... Squad K attack him? Huh? He didn't exactly give it the old college try. It smacks of putting off the dilemma. Arion doesn't attempt to teleport, he doesn't attempt a physical attack, it's almost as if my potential criticism from last month, that this was going to be a pointless, inevitable throwdown, was so thoroughly avoided that there was practically no fight at all. Point of fact, most of this issue was philosophical, and that's usually cool, but unfortunately in this case it's covering a dilemma in several contradictory respects and furthermore, doesn't resolve it. Superman doesn't follow Arion's thermal trail, which is odd, and Arion doesn't teleport, which is even stranger still. All in all, the dialogue is written well, the action and the beats weren't redundant, and had some compelling moments, like the Action Comics homage and the humor with the Prankster, the pie being a great diversion, if cute. But beyond that, nothing stands out here as something epic. Where is the larger canvas? Where are the stronger, more worthy villains? Why does this read as a character study rather than a Superman comic? The response to the question on the cover, "Who is Squad K?" is for me, largely, "Who cares? Where's Luthor?" And will remain. I want something well-written AND compelling. Art - 5: Pacheco still does a very good job of showing both this story and a strange, compelling vision of Metropolis that has been fairly consistent since Infinite Crisis. The panels all pop with detail. A little girl was asking me about comics yesterday, and I pulled out two examples, Ultimate X-Men, and Superman #664, to show her the difference between passable art and great art. Ultimate had compelling poses and distinct characterization, but this issue carries it to the next level by not forgoing backgrounds, which I find crucial to great art. Pacheco's world really elevates itself in this issue, and it's fine work. He's a great artist. Give Lois some hair, and we're talking gold. Cover Art - 1: Meh. I mean, seriously meh. I looked at this cover and, as I said above, my response was, "Who is Squad K? WHO CARES!" I hate words on the cover. I mean, I really, well and truly do. It's so ridiculous, it's like a thought bubble nowadays. Even Bendis can't make one pop. Arion looks like a line drawing from ancient text, and Superman looks disjointed and awkward. Squad K looks all the same. Superman's near bowel-movement territory. I don't get the symbolism. It's just. I mean, it's drawn decently well, but that can't make this compelling for me.